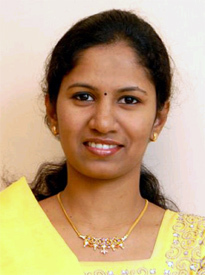 Nithya Mangala Rajasekaran is the blogger behind the “Fourth Sense Samayal”, which means fourth human sense is the taste. She has a master’s degree in information technology. Currently she is freelancing for an IT company in the United States. She was born and brought up in Chennai. She grew up with Indian food in a closely knit family of four, which includes her dad, mom and an elder sister. Cooking is her latest passion as she is still new to the kitchen. Learning new dishes from her mom and getting trained in the kitchen is her present hobby. Other than cooking, she is very interested in music, art and crafts. [Nithya] Cooking is just blending the right things rightly in right proportions to right royally flatten your family and of course, it’s a BIG challenge. But, “enjoy” what you make and when you make it, it will ultimately make others relish the food too. My philosophy of cooking is spread your happiness through the food you make. [Nithya] Since I was born and brought up in India, Indian food is nothing new to me. It’s all what I have enjoyed throughout my life so far. As the saying goes, "necessity is the mother of invention", When life changes and when I crossed my teens, I was introduced to the kitchen by my mom and she insisted me to learn cooking as well as copy down her cook book for later reference. With my IT background, I really wanted to record my recipes as a blog which would help me as well as others worldwide. That was when the “fourth sense samayal” was born. The name comes after the fourth human sense being the taste. 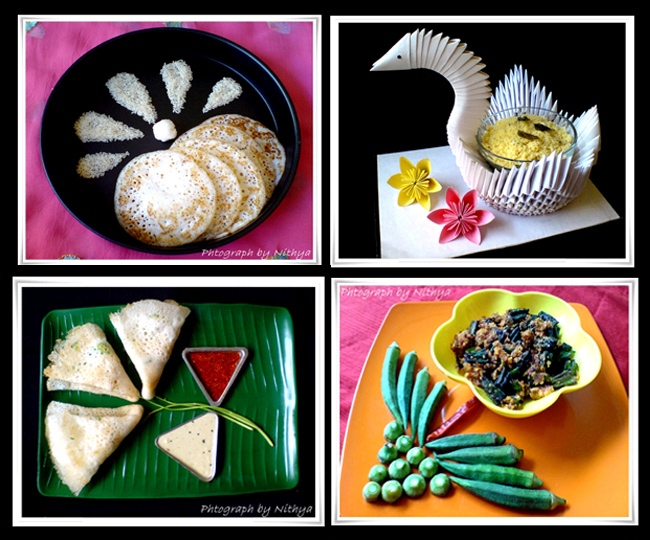 [Nithya] Simple and interesting recipes along with well presented photographs are my blog mantra. I blog about very simple recipes that even a kitchen novice can try. [Nithya] There are a lot of yummy food blogs available on the blogosphere and most of them are my favorites. Each of the blog or site has its own authenticity and creativity involved. I love well presented food and sites that include drool worthy pictures along with the recipes. [Nithya] South Indian meals accompanied by vada and payasam served authentically in a banana leaf is my all time favorite to make for myself, family and friends. I love to eat cakes and others desserts, but I am still in the verge of mastering it. 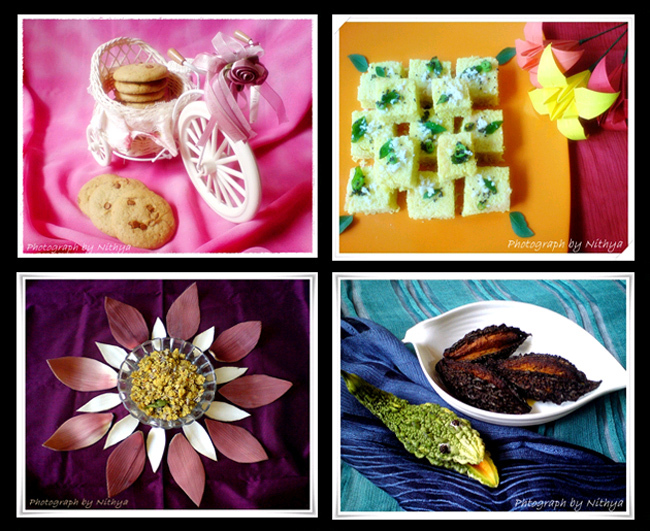 [Nithya] Food photography plays a very vital role when it comes to food sites and blogging. Simply a recipe put down would not be appealing for the viewer. A well presented photograph of the outcome of the recipe is what would attract anyone to the blog. The garnish and appearance of the food is as important as the taste itself. I am a photography freak who loves cooking too. So I love to experiment a lot on food photography. Present the food neatly in a dish. Lighting is the most important aspect for a good photograph. So place the dish where natural light is in abundance. Photographs can look great irrespective of the camera used. I use my Sony Ericsson 3.2 mp mobile camera to click pictures. So no wonder any camera could do the job well too, its just the way you use it. Lastly try to garnish the dish as interestingly as possible with some vege carving, fruit carving, decorating with the raw materials or even some properties etc. This would make it more appealing.